This nifty indicator could determine when the Fed will stop lifting interest rates. If you want to know what the US Federal Reserve may do next with official interest rates, the chart below may be of interest. From Westpac Bank, it shows the relationship between the employment-to-population ratio for 25 to 54-year-olds, known as prime working-age population, compared to the annual percentage change in US employee salaries and wages. The scale on the X axis is presented as 100 minus the prime working-age ratio. 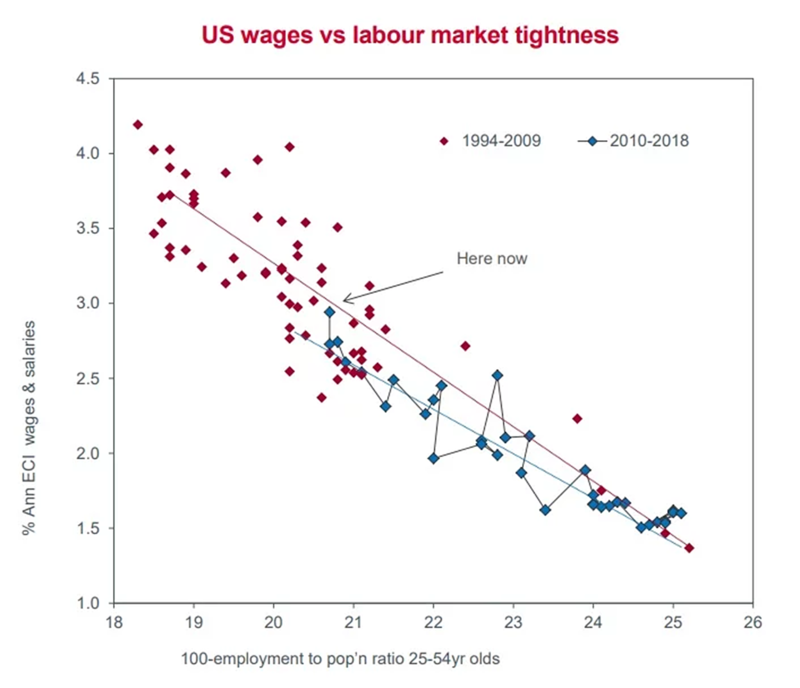 As the chart shows, there’s a good relationship between the two — when the proportion of workers in employment is higher, wages and salaries increase faster, and vice versus. Currently, the proportion of prime workers with a job is increasing, helping to explain why wages and salaries are growing at the fastest pace at any point since the GFC. Labour market conditions are tightening with fewer available workers around to fill a large and increasing number of vacant positions. Given changes in wages and salaries are influential on both inflation and household consumption, it helps explain why the Fed is continuing to increase interest rates given recent trends. Should that continue, it will likely continue to tighten policy settings in the period ahead. Conversely, should recent trends start to stall, it will point to a potential turn in the outlook for GDP growth and inflation, a scenario that will likely see the Fed change direction in terms of the outlook for policy settings.